5. Sometimes, a 132 kV circuit could be carried on a line designed for 275 kV or 400 kV. Then the magnetic fields could be larger than shown here. 7. Sometimes, a 132 kV circuit could be carried on a line designed for 275 kV or 400 kV. Then the electric fields could be larger than shown here. Two main types of 132 kV underground cable are used. single cable: the three cores are twisted round each other in a single outer sheath. With a single cable, because the cores are so close together and twisted, the fields they produce directly are very small. Instead, the field comes from any net current in the sheath. This cannot be predicted accurately. The following graph shows typical fields for these two types of cable (separate cores produce higher fields close to the cable but lower fields away from it). 3. Calculations for separate cores ignore zero-sequence current. This means values at larger distances are probably underestimates, but this is unlikely to amount to more than a few percent. 4. 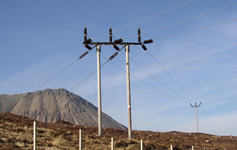 Cable designs are not standardised to the same extent as overhead lines and the examples given here are representative. 5. In practice, there are often several cables nearby, and the fields interact with each other.